The percentage of Los Angeles residents who were foreign-born exploded 1980 to 2000 from 27% to 41%. Los Angeles Almanac Image. The U.S. Census records 2,950,010 people in the City of Los Angeles and 7,477,657 people for all Los Angeles County. The Los Angeles River overflows its levees in Long Beach, sparking concern that the flood control system is inadequate to handle a "100-year" flood. The Ford Motor Co. assembly plant in Pico Rivera closes. Since its establishment in 1957, the plant had rolled out more than 1.4 million new vehicles from its assembly lines. Westlake Village is incorporated as a city. Los Angeles celebrates its 200th anniversary. The first case of AIDS appears in Los Angeles County. Due to a persistent Mediterranean Fruit Fly (Medfly) infestation that started in Los Angeles, California finds itself facing quarantine restrictions by other states that threatens to cause considerable damage to the agricultural industry. Authorities launch an aerial spraying assault on infected areas across the state. Mediterranean Fruit Fly (Medfly). Photo by Scott Bauer, courtesy of U.S. Department of Agriculture. Agoura Hills is incorporated as a city. L.A. Mayor Tom Bradley is defeated by George Deukmejian for the Governorship of California. The Oakland Raiders professional football team moves to Los Angeles. Sherman Block is elected Sheriff of Los Angeles County. Mayor Bradley and WWII aviation hero General James H. Doolittle conduct groundbreaking ceremonies for the new Tom Bradley International Terminal at the Los Angeles International Airport (LAX). The D.A.R.E. program is brought to L.A. Unified schools. The Temporary Contemporary Art Museum opens in downtown Los Angeles. Cynthia Barbee becomes the first woman firefighter in Los Angeles County when she joins the Los Angeles County Fire Department. West Hollywood is incorporated as a city. The L.A Raiders defeat the Washington Redskins 38-9 in Super Bowl XVIII. The XXIII Olympiad summer games are held in Los Angeles. The Aerospace Museum in Exposition Park opens. John DeLorean is acquitted in a Los Angeles federal trial. His defense portrayed him as entrapped by federal agents in a drug-selling conspiracy to save his failing auto company. Richard W. Miller, a long-time Los Angeles FBI agent, is arrested on charges of passing government secrets to the Soviets. The San Gabriel and San Fernando Valleys begin using the new telephone area code 818. The new $123 million Tom Bradley International Terminal officially opens. Alonzo Babers of the USAF Academy in 400-meter track & field event at 1984 Olympics. Photo by U.S. Dept. of Defense, American Forces Information Service, courtesy of Nation Archives. Roger M. Mahony is appointed to be Archbishop of Los Angeles. The environmental group Heal the Bay is formed in Santa Monica in response to increased pollution of shoreline water. The Los Angeles Music Center Opera is founded. "Hands Across America" forms a human chain of more than 5 million people stretching 4,150 miles (with gaps in sparsely populated areas) from Long Beach to New York City. An Aeromexico DC-9 jetliner on approach to LAX collides in mid-air with a small Piper aircraft over Cerritos. . 92 people are killed in the crash including 15 on the ground. The accident is determined to result from limitations of the air traffic control system to provide collision protection. Two separate fires force the closure of the Los Angeles Central Library. The first Los Angeles Marathon is held. Mayor Tom Bradley is defeated again by George Deukmejian in his bid to become governor of California. Crash site of Aeromexico Flight 498 in Cerritos, 1986. Photo from National Transporation Safety Board. Santa Clarita is incorporated as a city. Pope John Paul II visits Los Angeles. The Whittier Narrows Earthquake jolts the Los Angeles area. The "Justice for Janitors" labor campaign begins. The Mediterranean Fruit Fly (Medfly) reappears in larger numbers, resulting in a quarantine of the Los Angeles area and renewed aerial spraying of malathion. Whittier Narrows Earthquake aftermath, 1987. Photo by G. Reagor, courtesy of U.S. Geological Survey & NOAA/NCEI. A stray bullet fired by feuding gang members kills a Long Beach woman in Westwood. The incident brings gang violence to the forefront of attention in Los Angeles. The U.S. Environmental Protection Agency imposes stricter limits on Los Angeles County. The Mediterranean Fruit Fly (Medfly) yet again reappears in larger numbers, resulting in the further quarantine of the Los Angeles area and renewed aerial spraying. Diamond Bar is incorporated as a city. The Los Angeles Herald Examiner ceases operations, leaving Los Angeles with only one major daily newspaper. --- Becoming the largest U.S. drug seizure to date, Federal agents seize 20 tons of cocaine and $10 million in cash from an unguarded warehouse. Federal law enforcement officials declare Los Angeles to be the nation’s leading narcotics distribution center. --- The 73-story First Interstate Tower is completed in downtown Los Angeles, becoming the tallest building west of the Mississippi River. --- Richard Ramirez, the "Night Stalker," receives the death sentence for 13 counts of murder. --- L.A. City Mayor Tom Bradley is elected to an unprecedented fifth term, but he faces allegations that he was responsible for the deposit of $2 million in public funds in a bank employing him as a consultant. --- The U.S. Army sends doctors to train at the trauma ward at Martin Luther King Jr/Drew Medical Center. --- The LAPD begins training recruits in the use of semi-automatic weapons. --- The decaying Pan Pacific Auditorium is destroyed by fire. --- The largest infestation of Mediterranean Fruit Flies in Los Angeles County is first found near Dodger Stadium. --- Art Shell is hired to coach the Los Angeles Raiders, becoming the first African American NFL coach. --- Newly retired President Ronald Reagan and his wife arrive from Washington D.C. to live in Bel-Air. --- The Gene Autry Museum of Western Heritage opens. Final edition of the Los Angeles Herald-Examiner, 1989, with old postcard showing Herald Examiner Building. Courtesy of Wikimedia Commons. The U.S. Census records 3,485,398 people in the City of Los Angeles and 8,863,164 people for all Los Angeles County. The Long Beach to Los Angeles Blue Line rail opens. --- LAPD Chief Darryl Gates proposes before a Senate Committee that casual drug users be shot. --- After the second mistrial in the McMartin child molestation trail, L.A. District Attorney Ira Reiner announces that he would retry defendant Raymond Buckey a third time. --- A fire in the Metro rail tunnel forces the Hollywood Freeway to close for more than a week. --- The Port of Los Angeles surges ahead of the Port of New York as the nation’s busiest seaport. The Walt Disney Company discloses plans to build a $2.8 billion resort and theme park in Long Beach named Port Disney and Disney Sea. MTA Blue Line Between Los Angeles and Long Beach at Slauson Station, as seen 2011. Photo by Justefrain (own work), courtesy Wikimedia Commons. Malibu and Calabasas are incorporated as cities. After the U.S. Supreme Court reaffirms a historic redistricting plan that favors a growing Latino population, Gloria Molina becomes the first woman and first Latino in the 20th century to be elected to the Los Angeles County Board of Supervisors. --- A USAir jetliner and a SkyWest commuter plane collide on a runway at LAX, killing 34 persons and injuring 24. Investigators point to air traffic controller errors. --- Motorist Rodney King, after being pursued by California Highway Patrol, is stopped and beaten by LAPD officers. Unbeknownst to the officers, the incident is videotaped by George Holliday from his home. The video is subsequently televised on local and national television, sparking outrage and outcries for an investigation. --- Four LAPD officers are charged by the L.A. District Attorney with police brutality in connection with the Rodney King incident and are tried, but, acquitted in a Simi Valley Superior Courtroom. --- An independent commission headed by Warren Christopher releases a report criticizing the LAPD’s relationship with the community. --- L.A. County Sheriff’s Deputies shoot and kill a gang member at Ramona Gardens housing project, sparking long simmering complaints of police brutality against Latinos. Sheriff Block agrees to appoint a citizen panel to recommend reforms. --- Judge Joyce Karlin imposes a light sentence on a Korean-born grocer convicted of fatally shooting a black teenage girl in a dispute over an orange juice bottle. The sentence ignites complaints of racial injustice in Los Angeles courtrooms. --- General Motors decides to close the last Southern California auto-making plant, located in Van Nuys, putting 2,600 people out of work. --- Earvin "Magic" Johnson announces his retirement from the Los Angeles Lakers because of his HIV-positive diagnosis. --- Western, Eastern and Southern Los Angeles County begin using the new telephone area code 310. After a number of political and regulatory setbacks, the Walt Disney Company cancels plans for an ocean-oriented $2.8 billion resort and theme park in Long Beach. Los Angeles County Supervisor Gloria Molina in 2008. Courtesy of County of Los Angeles Board of Supervisors. Los Angeles suffers severe winter flooding. --- Sparked by acquittals of the four LAPD officers tried for the videotaped beating of Rodney King, Los Angeles erupts five days of civil arrest (Apr 29-May 5), resulting in 63 deaths and considerable damage. National Guard and federal troops are called in to help restore order. --- Rebuild LA is formed in the aftermath of the destruction under the leadership of former Baseball Commissioner and Los Angeles Olympic Committee head Peter Ueberroth to help regenerate business and opportunity in distressed areas of Los Angeles. --- Philadelphia Police Chief Willie Williams is named successor to retiring LAPD Chief Darryl Gates. --- The first Metrolink commuter train begins operations. --- Yvonne Brathwaite Burke becomes the first African American elected to the L.A. County Board of Supervisors. --- Leticia Quezada becomes the first Latina president of the L.A. Board of Education. --- Five-term L.A. City Mayor Tom Bradley announces that he would not seek another term. --- U.S. Congressman Edward Roybal, dean of Los Angeles Latino politics, retires. --- Magic Johnson rejoins the L.A. Lakers after his retirement in 1991, but retires again only two months later after complaints about him being HIV positive. --- The Spruce Goose, the enormous cargo aircraft built by Howard Hughes that was displayed in Long Beach adjacent to the Queen Mary, is disassembled and shipped to Oregon. --- Some of the easternmost communities of Los Angeles County begin using new telephone area code 909 along with San Bernardino and Riverside Counties. --- A Bellflower kindergartner becomes the one-millionth person to sign up for a library card in the Los Angeles County Library System. Wildfires hit Los Angeles County causing two deaths and the loss of 720 structures. --- Richard Riordan is elected to be the first new mayor in Los Angeles in 20 years. --- Malibu suffers a major wildfire resulting in three deaths and is declared a disaster area. --- Former LAPD officers Stacey Koon and Laurence Powell are convicted in Federal Court on charges of violating the civil rights of Rodney King. --- The first openly gay City Council Member, Jackie Goldberg, is elected in Los Angeles. --- Two men plead guilty and two others are convicted in the beating of trucker Reginald Denny at the start of the 1992 Los Angeles riots. --- The Los Angeles Central Library finally reopens after suffering two devastating fires in 1986. --- L.A.’s first subway, the Red Line, begins operations. --- The Museum of Tolerance opens in West Los Angeles. --- The Bullock’s Wilshire store closes. --- Universal City opens City Walk. --- The new Century Freeway (Interstate 105) opens. Universal Citywalk as seen 2009. Photo by Brokensphere (own work), courtesy of Wikimedia Commons. Los Angeles experiences the 6.7 Richter Scale Northridge Earthquake at 4:31 a.m. (Jan 17), resulting in 61 deaths and damage estimates of up to $20 billion. --- Nicole Brown Simpson, the wife of football star and actor O.J. Simpson, and friend Ronald Goldman are found brutally murdered. O.J. Simpson is charged with the double murder, but disappears before he can be arrested. He reappears with long-time friend Al Cowlings in a white Ford Bronco, leading a widely televised slow-motion police chase along freeways in Orange and L.A. Counties. Simpson is finally arrested without incident after arriving at his Brentwood home. --- World Cup Soccer is held at the Pasadena Rose Bowl. --- The Peterson Automotive Museum, Craft and Folk Art Museum and Museum of Miniatures open on Museum Row on Wilshire Boulevard. --- Entertainment moguls Steven Spielberg, Jeffrey Katzenberg and David Geffen form new entertainment company Dreamworks SKG. --- While tunneling sixty to eighty feet beneath Hollywood for the MTA subway, construction worker Michael Guinther makes a series of Ice Age fossil discoveries, some estimated to be as old as 280,000 years. The 11-month O.J. Simpson murder trial begins in L.A. Superior Court under Judge Lance Ito. Simpson is represented by a legal “dream team” initially led by Robert Shapiro, but later by Johnnie Cochran against the L.A. District Attorney’s prosecutors Marcia Clark and Christopher Darden. Northridge Earthquake damage on I-10 at Venice Boulevard in Culver City, 1994. Photo by G. Reagor, courtesy of U.S. Geological Survey & NOAA/NCEI. The Ambassador Concert Hall in Pasadena closes. --- Heavy Rains cause mudslides and floods. --- An audit of the MTA subway project finds MTA officials had shredded documents, leaked bid data, and attempted to hide apparent misconduct. --- Legendary Hollywood restaurant Chasen's closes after 58 years. --- The Los Angeles Rams football team leaves Anaheim for St. Louis. The Raiders also leave Los Angeles to return to Oakland. --- The Port of Long Beach becomes the nation's leading handler of ocean containers. --- UCLA wins its first national basketball championship in 20 years when it defeats the University of Arkansas. --- Nearly 1,000 people march in Downtown L.A., demonstrating the loss of relatives to gun violence. --- In three incidents, three Carole Little employees are slain. Threats and violence against the L.A. apparel maker cause fear throughout the L.A. fashion industry. --- Walt Disney purchases Capital Cities/ABC for $19 billion. --- U.S. Senator Bob Dole criticizes Hollywood for debasing American culture. --- The Long Beach Naval Shipyard and 3,000 jobs are slated for termination by a Defense Department base closure panel. --- The Unabomber makes a July 4th threat to blow up an airplane at LAX, but then calls it a prank in a follow-up letter. --- U.S. immigration agents raid garment sweatshops in El Monte, uncovering what resembles a slave operation of 60 Thai workers. Agents make 55 related arrests at three other locations in the Los Angeles area. --- In the ongoing O.J. Simpson murder trial, taped interviews with LAPD detective Mark Fuhrman are publicly aired to impeach the detective’s testimony that he had never used racist language. --- After an 11-month highly publicized trial, the jury finds O.J. Simpson not guilty of the double murder of ex-wife Nicole Brown Simpson and her friend Ronald Goldman. --- A severe budget crunch leads Los Angeles County supervisors to begin layoffs of county workers. The first L.A. County Health Services layoffs are made, but the federal government provides funds to save some positions. --- Metropolitan Transit Authority’s (MTA) first chief executive, Franklin E. White, is fired by the MTA board after L.A. City Mayor Richard Riordan and others blamed White for relentless bad publicity and problems with MTA’s subway project. --- Environmental group American Rivers calls the Los Angeles River the most endangered urban waterway in the nation. Long Beach Naval Shipyard, as seen in 1993. Courtesy of U.S. Department of Defense & Wikimedia Commons. The Army Corps of Engineers begins a controversial $312-million construction project to build concrete walls up to eight feet high atop levees along the last 12 miles of the Los Angeles River. --- Wells Fargo Bank buys out First Interstate Bank, the largest bank based in Los Angeles. --- After threats of secession, especially by the San Fernando Valley, L.A.’s City Hall begins serious discussion of city charter reform. Mayor Riordan and the City Council fail to agree on a plan, which leads to a court decision in favor of the mayor. The Mayor’s plan goes onto the April ballot. --- The FAA begins operations at the new $29 million 277-foot tall air traffic control tower at LAX. --- MTA’s inspector general and a U.S. Senate committee begin investigating the transit agency. Congress reduces funding for the MTA subway project. --- The largest brush fire in Southern California since the 1993 Malibu fires burns through the Santa Monica Mountains. --- After a two-year legal battle, the MTA agrees to an out-of-court settlement requiring it to deploy at least 152 more buses, reduce fares and provide safer rides. The lawsuit against the MTA accused it of favoring rail projects for more affluent commuters over poor and minority bus riders. --- The $498 million Harbor Freeway Transit Way opens - a 10.3-mile bus and carpool facility running along the Harbor (110) Freeway median. The project includes the first-ever viaduct built along an existing freeway in Los Angeles. --- The $75 million Skirball Cultural Center and Museum opens in Los Angeles. --- Hoping to build a new cathedral on the site of the earthquake-damaged, 120-year-old St. Vibiana Cathedral, the L.A. Archdiocese engages demolition crews to begin removing St. Vibiana’s cupola. Preservationists, however, in their ongoing legal battle with the archdiocese, obtain a temporary restraining order halting the demolition. The archdiocese is then compelled to seek out an alternate site for a new cathedral. A parking lot owned by the county between Temple Street and the Hollywood Freeway is purchased for $10.85 million. Spanish architect Jose Rafael Moneo unveils a preliminary model of the new cathedral. --- The historic Angels Flight railway reopens on Bunker Hill. 110 Harbor Freeway and Transitway, 1996. Courtesy of California Department of Transportation. Most of southeastern Los Angeles County, including Long Beach, switches from telephone area code 310 to 562. The same region had switched from area code 213 to 310 only five years earlier. --- The California Assembly passes a law making it easier for the San Fernando Valley to secede from the City of Los Angeles. --- Two heavily armed bank robbers wearing body armor engage police in a horrific shootout in North Hollywood. --- The City of Los Angeles imposes a business tax on home-based writers. --- With increasing criticism of his performance, led by Mayor Riordan, LAPD Chief Willie Williams agrees to vacate his job in exchange for a $375,000 severance package. Bernard C. Parks is selected to succeed him as Chief. --- Incumbent L.A. city mayor Richard Riordan defeats State Senator Tom Hayden for a second term. --- The San Gabriel Valley begins using new telephone area code 626. --- The Long Beach Naval Shipyard closes. Despite opposition by historic preservationists, Long Beach decides to demolish the former base and redevelop it as an ocean container shipping facility. Citing national security concerns, new opposition arises, however, when Long Beach proposes leasing the facility to a Chinese government-owned shipping company. --- The Getty Center opens. --- El Nino storms hit Southern California. Getty Center, as seen 2013. Courtesy of Carol M. Highsmith Archive & Library of Congress. Dodger Stadium, as seen 2012. After 48 years, the Dodgers leave the ownship of the O'Malley family in 1998. Courtesy of Jon B. Lovelace Collection of California Photographs in Carol M. Highsmith's America Project & Library of Congress. El Nino storms continue to batter Southern California, inflicting tremendous damage along the Malibu coastline. --- Construction begins on Staples Center, the newest Los Angeles area sports arena. --- Peter O’Malley, son of Walter O’Malley who brought the Dodgers from Brooklyn to Los Angeles in 1958, sells the team to Rupert Murdock. --- All but the most downtown portion of Central Los Angeles County using telephone area code 213 switches over to new area code 323. --- A freeway chase ends in a live televised suicide as a disgruntled HMO patient sets his parked pickup truck ablaze on a freeway interchange and shoots himself. The incident forces television stations to change their policy on live airing of possible violent confrontations. --- Los Angeles County voters pass a ballot measure to denying the use of county transit sales tax for additional subway projects, forcing planned extensions to the Eastside and Mid-City to be scrapped. --- The $100 million Long Beach Aquarium opens to huge crowds. 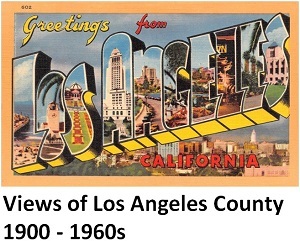 --- Website LosAngelesAlmanac.com launches, highlighting almanac information about Los Angeles County. It becomes the first comprehensive online almanac for a major metropolitan area. Lobby of the Aquarium of the Pacific in Long Beach. Los Angeles Almanac Photo. Northern Los Angeles County switches from telephone area code 805 to new area code 661. This area was the first in 1957 to break from area code 213. --- Voters amend the L.A. City Charter, last changed in 1924, to further disperse power in city government to protect against corruption. New charter provisions grant the Mayor of Los Angeles, one of the least powerful big city mayors in the nation, greater executive power and provides for formation of neighborhood councils, ostensibly allowing greater local participation in city government. The latter provision addressed one of the key concerns raised by the San Fernando Valley secession movement. --- A terrible fire causes $1.2 million worth of damage to St. Thomas the Apostle Catholic Church in the Pico-Union area, prompting Cardinal Roger Mahony to cancel a trip so as to visit the mostly Central American immigrant congregation and conduct services in the church parking lot. --- The Hollywood segment of the MTA Red Line opens. --- A jury awards a Los Angeles family a record-breaking $4.9 billion against General Motors for pain, disfigurement and punitive damages. The family had been returning from a 1993 Christmas Eve church service when a drunk driver rear-ended their Chevrolet Malibu at the 89th and Figueroa intersection, causing the Malibu to burst into flames. The damages are later reduced to $1.8 billion. --- The LAPD is hit by its worst scandal in 60 years when former officer Rafael Perez alleges that he and other Rampart Division officers engaged in illegal actions including perjury, staged shootings, false arrests, false evidence, witness intimidation, beatings, theft and drug dealing. Perez offers to cooperate on these allegations in exchange for a reduced sentence in his cocaine theft conviction. The L.A. District Attorney begins a review of hundreds of cases related to these allegations. The convictions of four men are consequently overturned and they are released from prison. --- Los Angeles Times management comes under fire for a special editorial piece in their newspaper about Staples Center and sharing advertising income from that piece with the Center itself. Reporters involved with the piece knew nothing of the arrangement. Legendary Times Publisher, Otis Chandler, comes out of retirement to openly criticize the actions. New city (yellow area) to seceed from the City of Los Angeles (remaining gray area), as proposed by San Fernando Valley secession movement. Los Angeles Almanac Map. The U.S. Census records 3,694,820 people in the City of Los Angeles and 9,519,338 people for all Los Angeles County. Former LAPD officer Rafael Perez agrees to a plea bargain with prosecutors for a five-year sentence on drug theft charges in exchange for providing informing on alleged corruption and police abuses within the Rampart Division. Perez names numerous other officers alleged to have committed similar offenses. Dozens of LAPD officers are consequently relieved of duty pending investigations. One alleged victim of police abuses is released from a 23-year sentence for assault on police officers. Perez admits to shooting, then framing the victim, who goes on to sue the city and receive a $15 million settlement. Later in the year, three former Rampart officers are convicted on police corruption charges from the investigation (a fourth officer is acquitted). The convictions are, however, overturned when a Superior Court Judge agrees that the jury considered irrelevant evidence. --- The Los Angeles Board of Education votes to abandon the Belmont Learning Center construction project after receiving reports of toxic gas leakage from the former oil field. By years end, however, due to increasing pressure for new space by a burgeoning pupil population, Superintendent Roy Romer and the board reconsider proposals to reopen the site as an educational facility. --- Key stockholders of the Times-Mirror Company, owner of the Los Angeles Times, agree to merge the company with The Tribune Company of Chicago in a deal valued at $6.8 billion. Los Angeles becomes the largest U.S. city without a locally-owned, general interest daily newspaper. --- The U.S. Justice Department threatens to take the City of Los Angeles to court over allegations of police and civil rights abuses. Mayor Richard Riordan agrees to expand the LAPD Internal Affairs Division, use more sophisticated methods for tracking officer behavior, grant more power to the Police Commission and Inspector General, and keep detailed race and gender statistics on police stops. --- Los Angeles County’s murder rate begins to inexplicably climb after a decade-long decline. LAPD Chief Parks pledges to deploy more officers on L.A. streets. --- About 30,000 delegates, party workers, media personnel and protestors descend on Los Angeles for the Democratic National Convention at Staples Center. --- The last three stations of the 15-year, $4.7 billion Metro Subway project open in North Hollywood, Universal City and Hollywood/Highland. --- Drivers and operators of the Metropolitan Transportation Authority (MTA) begin a strike that halts bus and rail service for 32 days, affecting mostly low-income, public transit-dependent riders. --- Screen Actor Guild (SAG) actors end a six-month strike against television commercial production in exchange for compensation from commercials appearing on cable television. The strike brings economic hardship to technical production workers dependent on production work. --- Steve Cooley soundly defeats two-term incumbent L.A. District Attorney Gil Garcetti. The candidates engaged in an unprecedented 15 debates. --- Democrat Adam Schiff defeats incumbent Republican James Rogan for the 27th Congressional District seat. Both candidates spent $10 million on campaign, making it one of the most expensive U.S. Congressional contests in the nation. --- Increased holiday electricity usage and sharply rising power prices due to a dysfunctional deregulation plan threatens the financial stability of Southern California Edison. The company warns of bankruptcy unless utility rates are increased. By contrast, the City of Los Angeles Department of Water and Power (LADWP), a municipal-owned utility exempt from deregulation, enjoys surplus power and the ability to keep rate hikes at bay. --- The 8,000-member Faithful Central Bible Church of Inglewood purchases the Great Western Forum in Inglewood for $22.5 million. Los Angeles Times Building in 2014. The newspaper's sale in 2000 left Los Angeles as the largest U.S. city without a locally-owned newspaper. Photo by Felicia Aparicio.